Every day we flip a switch. We graze a finger against a button, lever or dial on the wall and voila – our rooms, homes and offices are instantly brightened. And when it is time to leave the office or head for bed, in a split second the light is gone with another small movement of the hand. It’s a simple task that we don’t give much thought because we have it easy. 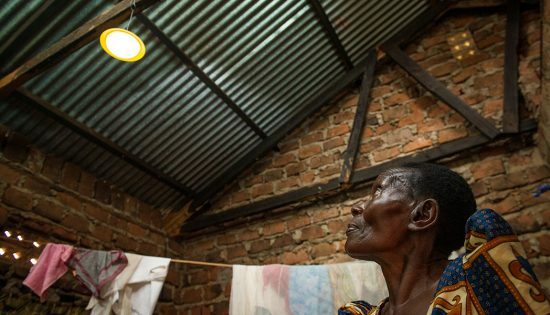 For 1.2 billion people around the world who live off the electrical grid, flipping a switch isn’t an option. They rely on dangerous or costly options or just live their lives in the pitch-black dark. They risk their health from toxic fumes of kerosene lamps or burning down their homes when a candle knocks over. They often end their days when the sun settles, leaving children with limited time to study or play. They don’t have it easy. This is a reality I recently learned on a trip to Uganda to visit FINCA clients who receive BrightLife solar lamps. Without the solar lamps in their homes, many of these clients had lived in the dark or worried about their children’s safety and health. But I soon realized that life has gotten easier for many of these families. On my first day in Uganda, we drove an hour outside the capital to a rural neighborhood in Mukono. Sixty-seven-year-old Margaret Nankonge lives in a small three-room house down a dirt road. Margaret is a vegetable farmer who takes care of her two young grandsons alone. While they attend school, she tends to her farm at the back of the house to harvest produce from her banana, cassava and aloe vera trees. As I sit in her tiny living room, she points to the solar lamps on her table, ceiling and wall. She then clutches one of the solar lamps in her hands, pressing it endearingly against her chest. Margaret recently received a BrightLife solar home system to light up her living room, bedroom and kitchen. A small solar panel on the roof lights up the three solar lamps. The power control unit on her wall also charges her phone, saving her time and money to walk down to the nearby market every couple of days. It wasn’t long ago that Margaret was depending on kerosene lamps to light her small house. Living with kerosene lamps was never safe. The light from the flames wouldn’t last long and the thick, toxic smoke it emits can cause a variety of health problems. Kerosene lamps are also easy to tip over, risking burning items in the house or, worse, someone’s skin. With her solar lamps, however, Margaret rests easy. She and her grandkids are living with new possibilities. She can use the once dark kitchen to cook well after the sun has set. Her grandchildren don’t have to worry about not being able to finish their homework. And, equally as important, Margaret is learning to enjoy simple pleasures, like reading her Bible or other books. Margaret’s sentiments aren’t unique. The many clients I visited in Uganda echoed living with fear when they used kerosene lamps or candles. But aside from safety and health concerns, Margaret’s story illustrates another point – that light brings productivity. FINCA recently surveyed BrightLife solar lamp clients and found a considerable number of respondents indicated an increased level of productivity. Some like Margaret have increased productivity with household chores like cooking. But for others, like Josephine Nabyalu, BrightLife solar lamps have increased productivity in the workplace. When the 45-year-old former teacher showed me her “canteen” near her home, I was surprised to find a frail wooden shack. On one side sat fresh vegetables and on the other she prepared snacks, like French fries and boiled corn. She started her food stall in 2010 in Wakiso, after she quit her job as a nursery school teacher because of the low salary. She needed more income to help pay for her three children’s higher education. But Josephine soon faced a problem with her business. She had lit kerosene lamps at her canteen at night, to lengthen her work day and earn more money. But it was risky to use the kerosene lamps. “At times, the smell would be so strong that customers would stay away,” she tells me. The kerosene lamps would often leak and contaminate her fresh produce, causing her to lose money. The light they emanated wouldn’t last long either, and often Josephine closed her shop before it got too dark. I waited around until the evening to see how Josephine worked at night. 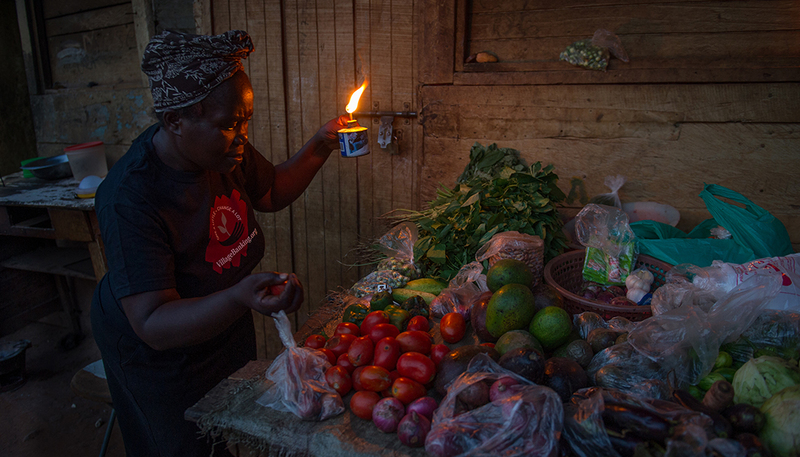 When the sky began to dim, Josephine pulled out three BrightLife solar lamps and placed them strategically around her vegetable stall. Each lamp provides up to 36 hours of light on a day’s charge, allowing Josephine to work as late as she wants. 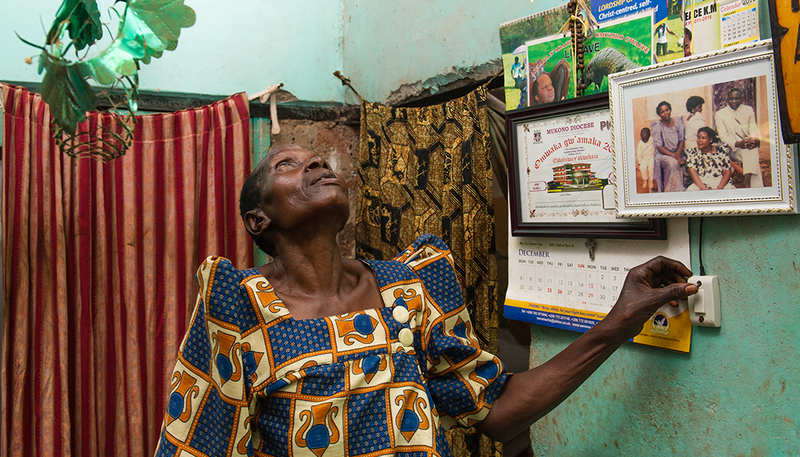 Usually, Josephine keeps her canteen open until 10 pm which has helped to increase her income. “There is now enough light to attract customers to my business,” she says proudly of her solar lamps. When I returned to my hotel later that evening, I thought about the families I had met. I thought about how a simple, solar device has given them so much joy and purpose. And then the realization set in. For Margaret and Josephine and many other BrightLife clients, light is life. Light is being able to tend to a crying baby in the middle of the night. It is being able to read a book to a child. It is being able to see the food you are about to eat. It is being able to spend time with your family, friends and neighbors. And it is being able to stay up later to work a little bit harder. Back in the United States, I have begun to pause each time I have to flip a switch, remembering Margaret, Josephine and others who can now share the joy of a simple hand movement to light up their own lives.